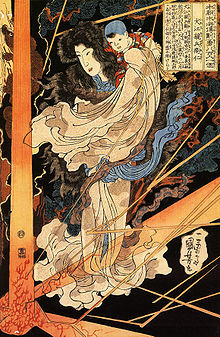 Utagawa Kuniyoshi's woodblock print of Princess Fuse saving Inue Shimbyoe Masahi from a thunderbolt, a scene from Nansō Satomi Hakkenden. Nansō Satomi Hakkenden (Japanese: (in kyūjitai) 南總里見八犬傳; (in shinjitai) 南総里見八犬伝) is a Japanese epic novel in 106 volumes by Kyokutei Bakin. The volumes were written and published over a period of nearly thirty years (1814–42). Bakin had gone blind before finishing the tale, and he dictated the final parts to his daughter-in-law Michi. The title has been translated as The Eight Dog Chronicles, Tale of Eight Dogs, or Biographies of Eight Dogs. Yang Lin, a hero from the Chinese epic novel Water Margin or Suikoden in Japanese, from Utagawa Kuniyoshi's series of woodblock prints, 108 Heroes of the Suikoden. Set in the tumultuous Sengoku period (350 years before Bakin lived), Hakkenden is the story of eight samurai half-brothers — all of them descended from a dog and bearing the word "dog" in their surnames — and their adventures, with themes of loyalty and family honor, as well as Confucianism, bushido and Buddhist philosophy. One of the direct inspiration sources of the novel is the fourteenth to seventeenth-century Chinese epic novel Water Margin by Shi Nai'an.[how?] Japanese translations date back to at least 1757, when the first volume of an early Suikoden (Water Margin in Japanese) was printed. An earlier serial novel by Bakin, Chinsetsu Yumiharizuki (椿説弓張月) (Strange Tales of the Crescent Moon) had been illustrated by the famous ukiyo-e artist Katsushika Hokusai, but the two did not work well together. 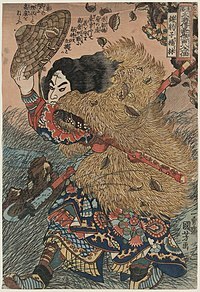 For Hakkenden, Hokusai's son-in-law, Yanagawa Shigenobu was employed as illustrator instead. A complete reprinting in ten volumes is available in the original Japanese, as well as various modern Japanese translations, most of them abridged. Previously, only a few chapters had been translated into English, Chapter 25 by Donald Keene and Chapters 12, 13, and 19 by Chris Drake. A full translation is currently in progress and is available on the Internet. Hugely popular at the time of publication and into the early twentieth century, Bakin's work lost favor after the Meiji Restoration, but came back into fashion later in the twentieth century. In live-action film and TV there have been numerous adaptions: the first[dubious – discuss] in 1938, then a series in the 1950s, and since the influential TV series Shin Hakkenden (ja:新八犬伝) from the early 1970s, every decade has had either a live-action adaptation or a show significantly influenced by the novel, right up through the 2010s. The novel has also been adapted into kabuki theatre several times. In August 2006, the Kabuki-za put on the play. In 1959, the TOEI motion picture company made Satomi hakken-den. ^ Shirane, Haruo (2002). Early Modern Japanese Literature: an Anthology, 1600-1900. Columbia University Press. p. 886. ISBN 0-231-10990-3. ^ Rimer, J. Thomas (2007). The Columbia Anthology of Modern Japanese Literature: From Restoration to Occupation, 1868-1945. Coughlan Publishing. p. 196. ISBN 0-231-11861-9. ^ Keene, Donald (1955). Anthology of Japanese Literature, From the Earliest Era to the Mid-Nineteenth Century. Grove Press. p. 423. ISBN 0-8021-5058-6. ^ Shirane and Brandon, Early Modern Japanese Literature, p564. ^ "Nansô Satomi Hakkenden". kabuki21.com. Retrieved 3 March 2018. Hamada, Keisuke (1983). "Nansō Satomi Hakkenden". Nihon Koten Bungaku Daijiten 日本古典文学大辞典 (in Japanese). 4. Tokyo: Iwanami Shoten. pp. 571–573. OCLC 11917421. Keene, Donald (1999) . A History of Japanese Literature, Vol. 2: World Within Walls – Japanese Literature of the Pre-Modern Era, 1600–1867 (paperback ed.). New York, NY: Columbia University Press. ISBN 978-0-231-11467-7. Wikimedia Commons has media related to Nansō Satomi Hakkenden. This page was last edited on 19 February 2019, at 07:05 (UTC).